Event Description : Alliance Française de Delhi with the support of Institut Français India & Le Pole Régionale des Musique Actuelles de la Réunion presents "Musical Greetings from Reunion Island"
In the framework of the bilateral relations between France and India, Alliance Francaise Network with the support of the French Institute in India / French Embassy in India, wished to highlight the culture of Réunion Island, a French territory whose geographical proximity to India and the mixed origins of its population constitute a strategic asset in the Indian Ocean. 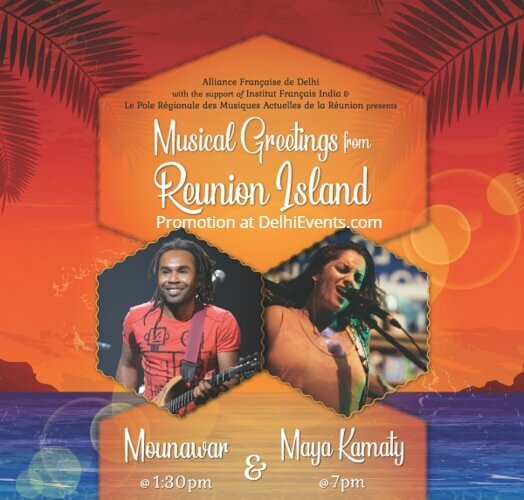 As part of the “Musical Greeting from Réunion Island”, two talented musical groups, Maya Kamaty and Mounawar will be presented, which are intended to highlight the culture of the island of Reunion. Mounawar has a rich and representative music of the Indian Ocean by these Afro rhythms. So it takes us to the crossroads, the boundaries of the world, cultures and feelings. The texts of Mounawar carry a Universalist message and revolted against the disrespect shown by men to each other and to their planet. Maya Kamaty is the daughter of Gilbert Pounia, the lead singer of Ziskakan, one of the most famous maloya bands to emerge from Reunion. Her music blends traditional maloya instruments with modern influences, and is a mix of African rhythms, modern harmonies and a touch of the blues. She sings primarily in Creole. The two groups will do a tour in India of the cities, New Delhi, Pune, Kolkata, Chennai and Pondicherry.